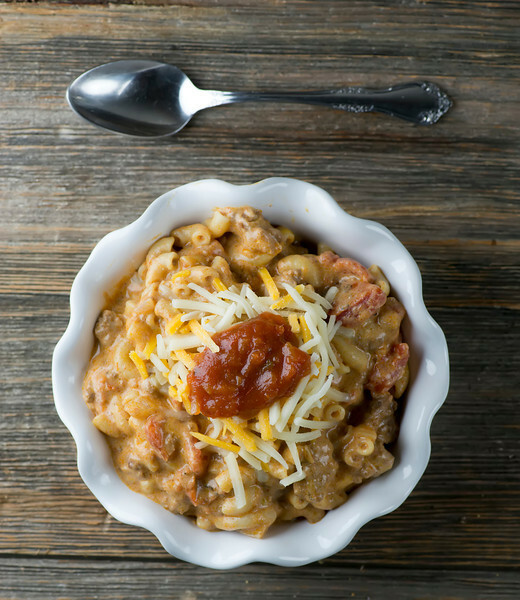 Try your taco in pasta form with this quick and hearty recipe for, yes, taco pasta! I do love a good taco. I do not like the crunchy shells that shatter on first bite though. I like the taste of them…it’s the shattering part that gets me. And yes, I know I can eat tacos with soft tortillas, but recently it occurred to me that good old everyday pasta would make an excellent stand-in for the taco shell…AND I would be able to eat it with a spoon. Somehow, things taste just a little bit better when a spoon is involved. Which is the convoluted way that my recipe for taco pasta was born! You start out the way you always do when you are making ground beef tacos – cook up the beef with some onions and some taco seasoning. When it is nice and browned, swirl in some cream cheese and some canned diced tomatoes. 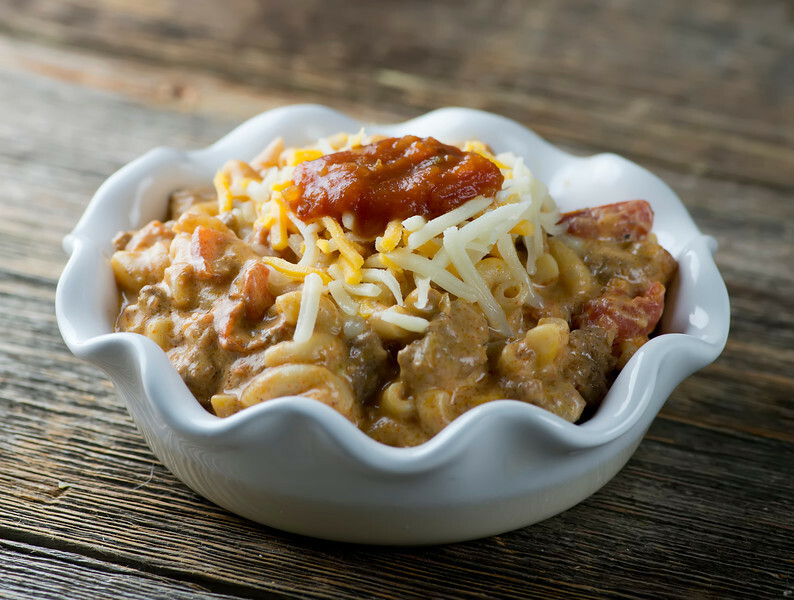 Once everything is all combined and creamy, stir in the pasta and some shredded cheddar. Give it another stir until everything is all nice and hot and melty. Now dish it up into bowls and top it with a little more cheese and some salsa. Sour cream and guacamole would also make fabulous toppings for this. Just like with tacos! So the next time you get a taco craving, give this pasta version a try. You may ditch the crunchy shells altogether! Brown beef and onion in a large skillet over medium high heat until beef is browned and onion is tender. Add taco seasoning and water and simmer for 5 minutes. Add tomatoes and cream cheese and stir until cream cheese is melted. Stir in pasta and cheddar and stir until cheddar is melted. Serve at once, topped with a little more shredded cheddar, salsa, sour cream and/or guacamole! Two of the absolute best foods – Together!!! Looks sooo yummy!!! I just made this the other day and hubby absolutely Loved it. He liked it better than my regular, boring goulash dish.